So began one of the first cryptic letters from one of history’s most notorious murderers, whose identity remains unknown but whose story was brilliantly immortalized onscreen in David Fincher’s 2007 film Zodiac. The unsung masterpiece about a serial killer in 1960s San Francisco who manages to evade police, all while sending taunting letters to the media to further promote his agenda, just celebrated its 10-year anniversary. We’re no closer to solving the mystery of the Zodiac’s identity, but we can solve the mystery of how Fincher and his collaborators—including stars Jake Gyllenhaal, Mark Ruffalo, and Robert Downey Jr.—created one of the greatest procedural thrillers ever made. Here are 15 facts to help you decode Zodiac. 1. ZODIAC COULD HAVE BEEN A DISNEY MOVIE. Disney owned the rights to former San Francisco Chronicle cartoonist and author Robert Graysmith’s source material and tried to make the film for over a decade before the rights to the books, 1986’s Zodiac and 2002’s Zodiac Unmasked, lapsed back to Graysmith in the mid-2000s. According to This is the Zodiac Speaking, the feature-length documentary found on the Blu-ray release, that gave screenwriter James Vanderbilt and producer Bradley Fischer the opportunity to approach Graysmith themselves to option the books to potentially make a film without the Mouse House. 2. IT WAS A FAX THAT GOT PRODUCTION STARTED. According to the same Blu-ray documentary, Graysmith informed Vanderbilt and Fischer that he was personally taking pitches from a handful of filmmakers now that he owned the rights to his books again, but only via a fax number through a local Kinko’s. The pair built their pitch—which Vanderbilt described as asking, "What if Garry Trudeau woke up one morning and tried to solve the Son of Sam"?—and eventually won the rights to make the film after they successfully sent the fax. 3. DAVID FINCHER AGREED TO DIRECT THE FILM BECAUSE OF ANOTHER UNSOLVED MURDER. After directing the 2002 thriller Panic Room, starring Jodie Foster and Kristen Stewart, Fincher began work on a five-hour, $80 million miniseries adaptation of author James Ellroy’s true crime novel The Black Dahlia. That project, chronicling the infamous unsolved 1947 murder of aspiring actress Elizabeth Short, eventually fell through (it was later made into a 2006 feature film by Brian De Palma). But according to This is the Zodiac Speaking, Fincher’s newly minted freedom led Vanderbilt and Fischer to approach him about directing Zodiac because it dealt with similar, noir-tinged police procedural themes. 4. FINCHER HAD A PERSONAL CONNECTION TO THE ZODIAC STORY. In addition to having an interest in the Zodiac Killer’s story from a filmmaking perspective, Fincher had a personal connection to the story, too. Though the director was born in Denver in 1962, his family relocated to California when he was two years old—just a few years before the Zodiac committed his first murder. So he grew up fearing the serial killer. 5. FINCHER, VANDERBILT, AND FISCHER CONDUCTED THEIR OWN INVESTIGATIONS. Once Fincher was on board, he, Vanderbilt, and Fischer agreed to develop further drafts of the screenplay to emphasize fact over fiction. They spent months poring over police documents and interviewing witnesses, investigators, and the case’s two surviving victims: Mike Mageau and Bryan Hartnell. 6. THE ONSCREEN KILLER IS HORRIFICALLY EXACT. Fincher wanted absolute verisimilitude in depicting the Zodiac attacks, so the only time the killer appears onscreen is during incidents where there are on-the-record survivors or witnesses to the real-life events. This includes the opening attack on Darlene Ferrin and Mike Mageau at Blue Rock Springs, the attack on Bryan Hartnell and Cecelia Shepherd at Lake Berryessa, and the killing of taxi driver Paul Stine at Washington and Cherry Streets in San Francisco. Survivors Mageau and Hartnell were consultants on the film, as was retired San Francisco Police Department inspector David Toschi (who was played by Mark Ruffalo in the movie). 7. IT WAS JENNIFER ANISTON WHO SUGGESTED JAKE GYLLENHAAL AND MARK RUFFALO FOR THE FILM. Because of his perfectionism, Fincher had difficulty finding actors to portray Graysmith and Toschi. But Jennifer Aniston, who at the time was married to Brad Pitt—whom Fincher had worked with on Fight Club and The Curious Case of Benjamin Button—suggested two of her former co-stars for the lead roles. In Fincher’s Blu-ray commentary, he shared how Aniston—who had worked with Gyllenhaal in 2002’s The Good Girl and Mark Ruffalo in 2005’s Rumor Has It—recommended them for Graysmith and Toschi, respectively. Fincher, in turn, loved Gyllenhaal in Donnie Darko and Ruffalo in Collateral, and agreed to cast them in the parts. 8. THE CAST LEARNED TO ENDURE FINCHER’S LEGENDARY MULTIPLE TAKES. Fincher has an infamous habit of demanding many, many takes for particular scenes. His work on Zodiac was no different, which proved to be a challenge for the three main actors, all of whom were Fincher rookies. 9. THE ZODIAC KILLER WAS PLAYED BY SEVERAL ACTORS. After the Zodiac first demanded that his ciphers be printed in national newspapers, one of his last known letters asked, “I am waiting for a good movie about me. Who will play me?” The answer, at least in Fincher’s movie, is three actors—or, depending on who you think the Zodiac Killer was, maybe four. As a way to keep the image of the Zodiac a mystery onscreen, he is played by three actors: John Lacy, Richmond Arquette, and Bob Stephenson. If you think Arthur Leigh Allen is the Zodiac, then actor John Carroll Lynch is the fourth individual to play the Zodiac in the movie. 10. ALL OF THE GORE WAS CREATED IN POST-PRODUCTION. The filmmakers didn’t have to worry about using squibs or fake blood packets for particularly bloody scenes on-set. To recreate murders scenes as accurately and quickly as possible while shooting the movie, all blood and gore was created using CGI in post-production. This allowed the filmmakers to dial back or go all-out on bloody fingerprints or blood spills as needed, and saved time and budget on costuming that would have been wasted if Fincher wanted to continually shoot multiple takes of these scenes. But the gruesome imagery took its toll on members of the digital team, like Eric Barba, the visual effects supervisor for Digital Domain, the company responsible for 200-plus effects shots for Zodiac. "I think because we are so desensitized to overly violent cinema that when you actually make violence authentic it's harder hitting," Barba told the Los Angeles Times. "This isn't a film where the body count piles up for fun. The murders have a point. We have feelings for these people." 11. THE COSTUMES ARE SPOT-ON. Costume designer Casey Storm was granted unprecedented access to police evidence photos for reference in recreating the costumes of the Zodiac’s victims and witnesses. These included victim Darlene Ferrin’s blue floral jumpsuit and survivor Mike Mageau’s actual July 4th ensemble, which included wearing three pairs of pants, four sweaters, a wool shirt, and a T-shirt all at the same time. The Zodiac’s executioner’s hood was recreated from Lake Berryessa survivor Bryan Hartnell’s personal recollections. 12. THE MOVIE BROKE NEW GROUND IN DIGITAL MOVIEMAKING. 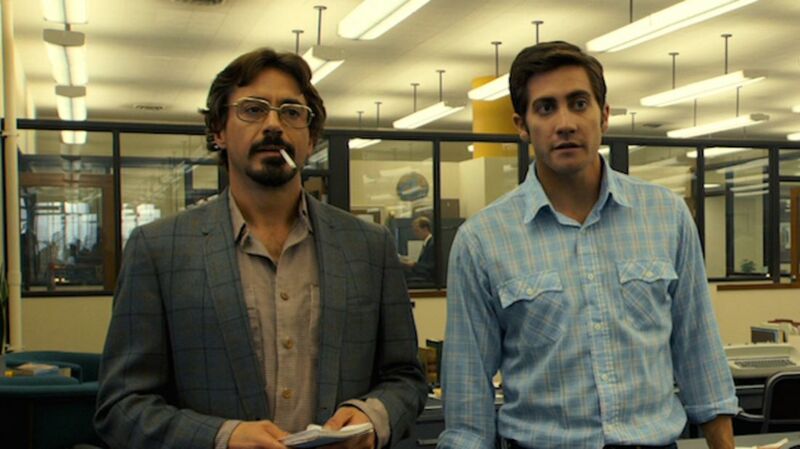 Zodiac was one of the first feature-length motion pictures to be primarily shot using a digital camera. Certain slow motion scenes—including one during the Blue Rock Springs opening—were shot on film, but the rest was photographed using a Thomson Viper Filmstream camera, which Fincher previously used for shooting commercials. The decision wasn’t meant to be some sort of revolutionary move to introduce what is now a nearly ubiquitous moviemaking method. Instead, Fincher simply hated how long it took to process daily film footage. “I liked the process of working digitally and I didn’t like waiting until the next day to see what I had shot,” Fincher explained. Similarly, Zodiac was one of the first feature movies to be edited using the inexpensive consumer software program Final Cut Pro. 13. WHEN FINCHER COULDN’T SHOOT IN SAN FRANCISCO, HE BUILT THE CITY IN A COMPUTER. Some scenes from the film were shot on location in San Francisco, but the scene where Toschi investigates the Paul Stine murder at the corner of Washington and Cherry Streets couldn’t be used in real life. Perhaps unsurprisingly, the area has changed significantly since the incident in 1969—and local residents weren’t anxious to attract attention while the production recreated a killing in their neighborhood. So Fincher shot the entire six-minute sequence on a soundstage using moveable, bluescreen panels. San Francisco’s Presidio Heights neighborhood was then composited in final shots using detailed drawings created by production designer Donald Graham Burt, matte paintings, and a series of high definition photographs of the area. The only details in the shot that aren’t CGI are the actors, the taxicab and cars, and the street curbside. 14. TO GET THE LAKE BERRYESSA SHOT JUST RIGHT, THEY HAD TO FLY IN SOME OAK TREES. Like the corner of Washington and Cherry, the Lake Berryessa location changed over time and had to be retrofitted to look like it did on the day of the attack, specifically the oak trees the Zodiac used to hide behind before he accosted Bryan Hartnell and Cecilia Shephard. But Fincher didn’t use CGI this time. 15. FINCHER WANTED TO INCLUDE A TWO-MINUTE MONTAGE SHOWING NOTHING. Film is obviously a visual medium, but to show the passage of time at one point in Zodiac, Fincher envisioned a two-minute audio montage over a black screen that included nothing but hit songs and period-appropriate audio clips to move the story from the 1960s into the 1970s. The director had final cut on the film, but agreed to excise the blackout montage due to studio pressure over the runtime of the movie approaching three hours. Instead, the blacked-out title card in the theatrical cut simply reads, “Four Years Later.” The full audio montage can still be seen (or heard) in the Director’s Cut available on home video.